“Interested in Predictive Analysis? So here we came, with a session on Machine Learning!..” The freshers and ML enthusiasts seemed to be on a cloud nine hearing this news. Our newly formed club DSC GGITS held a session on Machine Learning under the guidance of Sr. Aayush Shrivastava and our club lead Ms. Chanchal Vishwakarma on a bright day of 14 March,2019 at Gyan Ganga Institute of Technology and Sciences, Jabalpur. 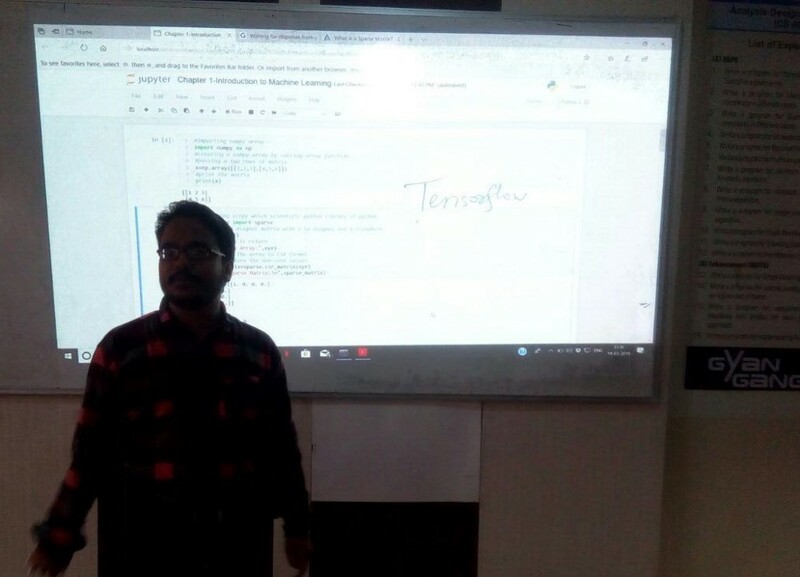 This Session was lead ML instructor Sr. Aayush, a very capable and highly skilled personality. Aayush is also an incubator at Smart City Incubation Center and have completed an Apprenticeship at Persistent System. He also bagged the winning awards in India’s most eminent technical hackathon festival, Smart India Hackathon 2019 and central India’s biggest hackathon, Hackfest Jabalpur. His skills include Machine Learning, Deep Learning, Android Development, Socket Programming and many more. In this session, the students were given the gist of Machine learning include Why, What and How factors. They were guided by side-by-side learning and Hands-on practice through Anaconda, NumPy and Scikit learning. Students also learnt about the vast applications of ML in fields of Health and Businesses. Applying concepts like sparse matrices are used for language processing, generalization, over-fitting, under-fitting, importing built-in modules and libraries like matplotlib, numpy for data sciences were hands-on. From target, target-names, datapoints, datasets to methods like np.eye() and np.arrange() everything was covered. Analyzing and predictions using nearest neighbor-classification were practiced. The students were also made to reflect upon the famous quotations by Elon Musk and Stephen Hawking about the threats that AI and ML may pose in future. “Errors per bit per quantum gate can be handled more efficiently by machine learning techniques. For quantum error correction deep learning algorithms provides greater promises.” However, real life applications and growing era shows that switching to ML can be a blessing in disguise.